"wow! It's just like playing live with a fifties rockabilly band..."
If you play rockabilly in a band or just by yourself this CD is for you. It has backing tracks with almost a full band just needing some lead and more simple stripped down tracks like old school rockabilly with just acoustic rhythm guitar and upright slap bass. This is an audio CD with rockabilly jam tracks to play or sing along to. It's called 'Jam With The Jime vol.II' because it's with The Jime's rhythm section like it appears on our records. Although these rockabilly jam tracks will fit the teaching in the 'How To Play Rockabilly Guitar - and get good, fast!' and 'Intermediate Rockabilly Guitar Lessons' like a glove, they will be useful for any musician on any instrument, guitar, piano, sax or harmonica - you name it. Track number 9 and 10 called TravisBacking are backing tracks made to practice the so-called Travis picking to, as laid out in my book 'Intermediate Rockabilly Guitar Lessons' chapter 8. ...It's like being on stage with a real live fifties rockabilly band - it's FUN! These are not midi songs like it’s often seen on jam tracks CDs and no synthesized sounds have been used, only real instruments. It's not just one recording that has been mechanically pitched into different tempos. All different tempos are different recordings. There are no vocals on the jam tracks - so sing if you want to! (1) "Rockabilly Backing Track in A Minor" is typical rockabilly, typical The Jime-style. The first version (w/2xE-rhythm guitar) has everything you'd expect for a "Pulp Fiction"-kinda sound track. Complete with echoed e-guitar rhythm and twangy effect chords. Perfect for adding your own lead on guitar, sax, piano, singing or everything put together. (2) The same thing but without the "floating" guitar chords. (3) Again, same track but only acoustic rhythm guitar, slap bass and drums. (4) Countrybilly in E. Typical 50s rockabilly with a Scotty Moore styled backing (In the style of the intro of "Don't Be Cruel"). The chord pattern fits "Blue Moon Of Kentuckey" and many other country flavored rockabilly songs. (5) The same thing but with a Luther Perkins style "boom-chicka-boom" rhythm guitar. (6) Again, same track but only acoustic rhythm guitar, slap bass and drums. (7) "OldSchoolRockabilly" styled after Elvis, Scotty and Bills version of That's All Right Mama. Fits many rockabilly and country songs. (8) The same thing but with a discrete set of drums added. (9) TravisBacking. Like the name says it's a backing track made to practice the so-called Travis picking to, as laid out in my book Intermediate Rockabilly Guitar Lessons chapter 8. (10) I've added some discrete drums, which makes it a little easier to play along to, if you're used to play in a band. (11) CarlBilly in A. This is a basic 12 bar start and stop blues format in A, but in the same slightly anarchistic way guys like the Perkins Brothers Band (think Carl Perkins) would play it. It's very "loose" (and fun) like some of the fifties bands played it. (12) CarlBilly in G. This is a basic 12 bar start and stop blues format in G. Same style as the previous. (13) Rockabilly Hand Clap. Make your own instrumental! If you're looking for rockabilly jam tracks in other tempos, keys and chord patterns you should sign up for the newsletter. 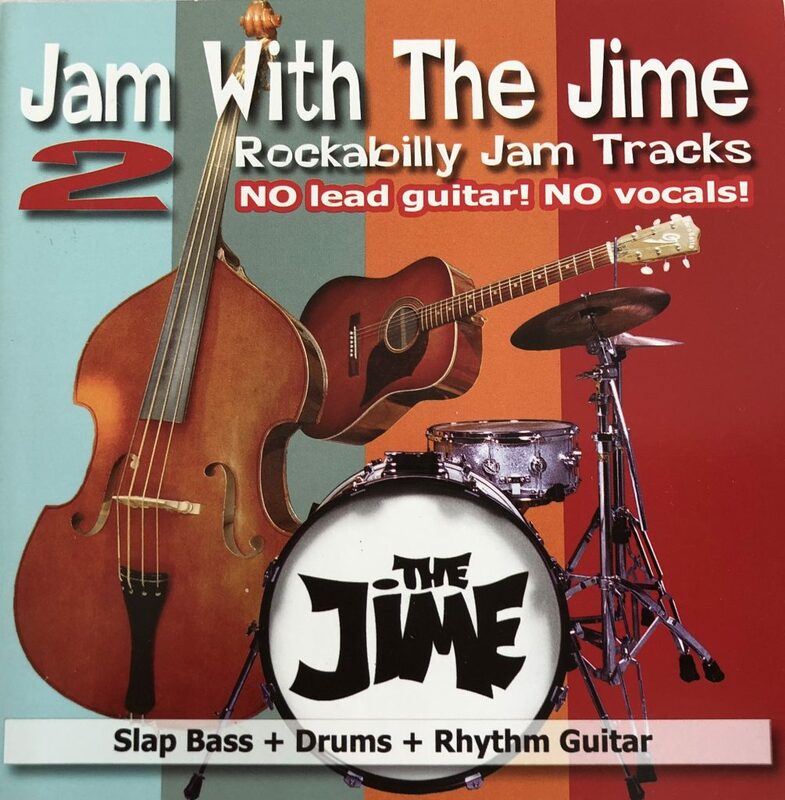 Check out the first CD "Jam With The Jime"
"I just bought the Jam CD #2 from Vince Gordon a week ago and it's the best Rockabilly back tracks that I own (along with the Jam CD #1). A very helpful cd to practice/play Rockabilly music on guitar. Very authentic Rockabilly music back tracks to jam with ... the right tone & feel. Excellent written description of each track to help you jam with the tracks. Highly recommended!" "I thought I wanted to be a blues player until I got my hands on vol.1 and vol. 2 of The Jime’s Rock-A-Billy backing tracks. Could not have more fun on my guitar. Even better than the tracks was the customer service I received fro these guys.